Are you a business looking for corporate team building activities in or around Melbourne to help strengthen employee bonds and boost productivity? Or maybe you just want to reward your hard-working team for delivering a great result on a tough project? Either way, a Reptile Encounter might be just what you’re looking for. We specialise and take great pride in our team building events, and we like to think we’re up there with the best and most fun-filled on the Melbourne market. Our marvelous corporate team building activities are always a hit with businesses of any size, and we always get every employee involved in the from, from directors all the way down to new graduates. We can come to your workplace and put on a fantastic performance customised to perfectly suit your needs – getting everyone involved in decision making, co-operation and problem solving. All of this is done to enhance team effectiveness and productivity. And we’ve found that, as well as bonding teams together more tightly, our team building events can be a great confidence booster, especially in helping people overcome their initial fears. 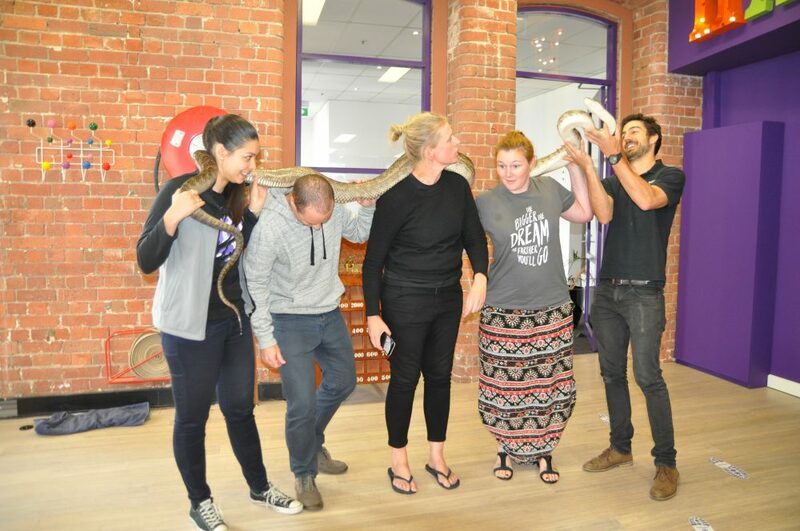 So if you’re searching for team building idea around Melbourne, and for an unforgettable day that will live long in the memory, look no further, we have the answers here at Reptile Encounters! Learning to deal with difficult situations is an important process. If you want your staff to get out of their comfort zones, this is the experience for you. Having fear is a normal response to a given situation and is actually important for keeping us safe. But being able to gain control in these situations can be a valuable tool. During a Reptile Encounters Show, your staff will be exposed to all sorts of critters including crocodiles, snakes, birds, tarantulas and maybe a few cuddly ones too. The experience can increase employee confidence, be useful for overcoming fears and help productivity on a daily basis. Team building in the office has a huge range of vital benefits. It can enable the managers to better understand the communication patterns of their workers, allow staff to better understand the impact they have on each other, and help to identify otherwise hidden issues between staff members. Being around and holding animals many people are fearful of, can assist in developing a culture of trust, and gives staff a day that is not only truly memorable, but a shared positive experience. This is where we introduce Amy the Scrub python, Australia’s longest species of snake. 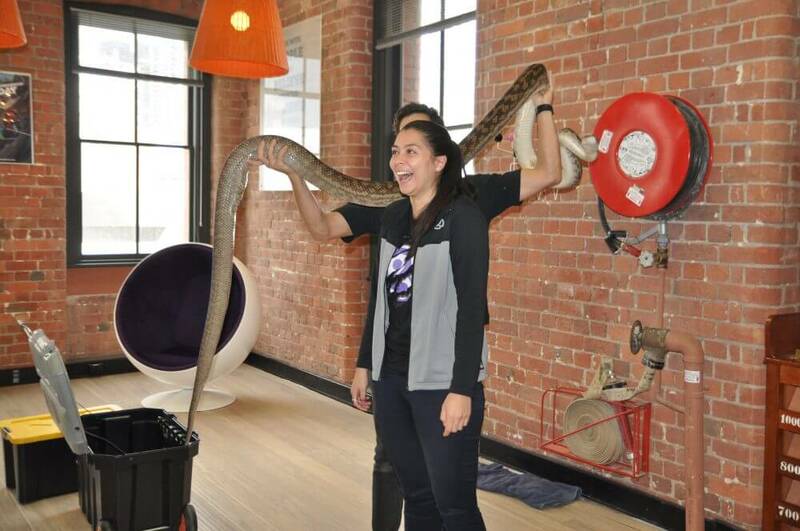 Or Olivia the Olive Python, Australia’s largest species of snake! Amy has been known to lift up Robert Irwin until the point his tippy toes were lifting off the ground! And at 4.7 metres and close to 20 kgs, she is one very impressive snake. The Reptile Encounters record for the most number of people holding Olivia at once is 14, she is BIG! 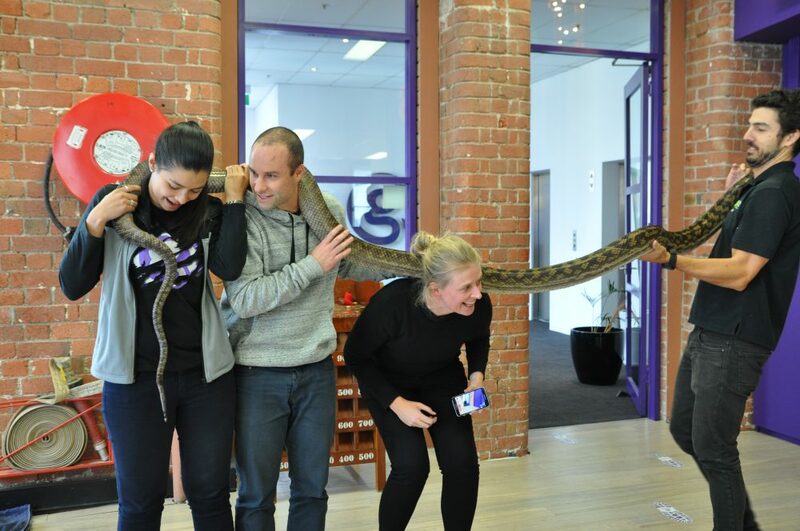 For this challenge your staff will have to work in unison to handle these amazing creatures. Watch how employees communicate and function as team. We guarantee it’ll be an experience they will never forget!